Trained assistance dogs have shown that they can sniff out an assortment of diseases, but the canine ability to smell seizures has never been thoroughly examined—nor has the existence of a distinct seizure scent ever been proven. An encouraging new study suggests dogs are indeed capable of the feat—and they’re actually amazing at it. If a seizure-specific scent does exist, or better yet, a pre-seizure-specific scent, it could lead to the use of assistance dogs or the development of special diagnostic devices—a so-called “electronic nose”—to alert the epileptic person and others to a pending seizure. The aim of the new study, published today in Scientific Reports and co-authored by Amélie Catala from the University of Rennes in France, was to see if dogs are in fact capable of detecting a general epileptic seizure odor. The results of this preliminary investigation were undeniably encouraging. 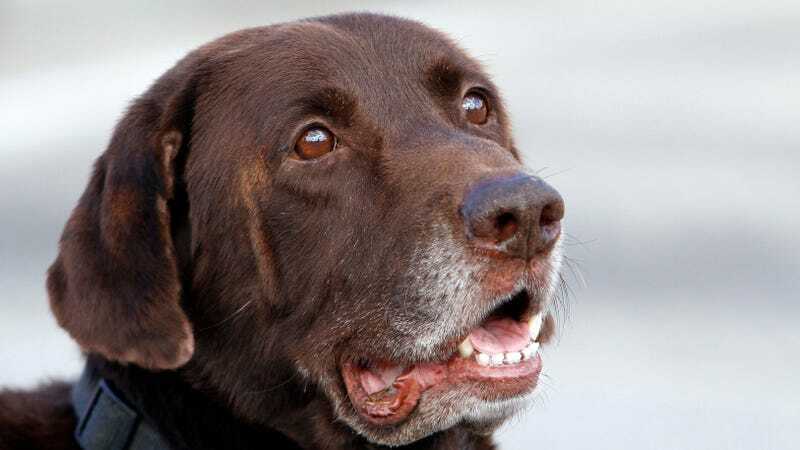 In experiments, Catala and her colleagues tested three female and two male dogs of various breeds, all of whom received prior training as disease-sniffing dogs. The dogs were initially trained to select a scent taken from a person who was having a seizure. Later, the canines were presented with breath and body odors captured from five other epileptic individuals during a seizure (the individuals had different forms of epilepsy). For the controls, the researchers captured odors from the same individuals when they weren’t having seizures and after an exercise session. The dogs were presented with seven cans, only one of which contained the seizure-specific odor. Each dog was tested nine times during the experiment. This particular experimental protocol is the same one used when testing the canine ability to sniff out cancer and other diseases. The results were very good. All dogs were able to positively identify the seizure bucket, and with success rates ranging from 67 percent to 100 percent (three of the five dogs scored perfect scores for all nine tests). Their ability to identify negatives, that is, non-epilepsy samples, was even better, ranging from 95 percent to 100 percent. Mean time the dogs spent exploring (in seconds) each odor type. The new research suggests that a generalized olfactory profile for epileptic seizures is real. In the future, the researchers would like to further validate the results using more dogs and patients, but “the dog sample size was in accordance with those in most studies on medical scent detection,” the authors wrote. Another important next step will be to determine if a scent is emitted by an epileptic individual prior to a seizure. Ideally, assistance dogs or diagnostic devices would be capable of detecting a pre-seizure signature, should it exist, and sound the alarm prior to a pending attack. And indeed, this is also where the research is headed next. Such an exciting result—and yet another example of how unbelievably useful our canines companions are.